No Dhimmitude says they don’t know if this is a hoax or not — they got it from a French website. While the loonies complain about Bushchimp and Can’t-Shoot-Straight Cheney, not to mention the “Dump Donald” brigade, here’s what this way comes. Don’t you wonder how those feminist academic ghettoes will take to the burqa? They all think alike, sound alike, and all too often dress alike. Perhaps a burqa would complete the picture. When I saw the Croatian checkerboard square crest and the words Republijka Hrvatska, by b.s. meter red-lined. I strongly think they’d have no room for something like this. Especially after the wars of the 90’s. Has to be a hoax. Frankly, I think this is most likely a hoax. A similar story was circulated in an e-mail in Australia a few months ago, purporting that a woman had been permitted to have her driver’s licence photo taken in burqa. I’ll wait for confirmation before I stoke my indignation engine. Common sense says that this is a joke, not real and not a hoax. A hoax and a glimpse of the future, then. It’s a well-done hoax, anyway. Very official looking, though absurd. The Burqa-wearing drivers license story was a hoax, too, but how about DRIVING while wearing a burqa? Sounds nuts, doesn’t it, but when the NZ police suggested a ban they ran into opposition – seems the burqa does not affect one’s ability to drive – Oh really? Some of those things only have a tiny grill in the front and no peripheral vision at all. My question is – if these women are so devout and traditional, what the heck are they doing driving? Let them try that in Saudi Arabia. ps – I once saw a burqa-wearing driver in the DC suburbs. The joke is on us. We shouldn’t even have to think about this kind of nonsense. How did something this absurd even arise? It arose because we don’t know where we stand as a civilization, as a people, as individuals. This is so obviously absurd that we shouldn’t have to think it over. But we must because we might have gone so far stupid that it could be true. And maybe it is true. Hey, I don’t know. 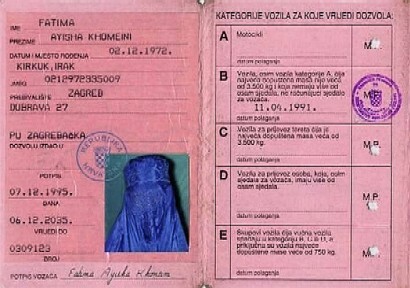 I think it’s entirely possible that there is a place in Europe where burqa’d women don masks for a driver’s licence. I can’t discount anything stupid these days. Dag,..the joke definitely is on us! The uk allows passport photos wearing religios headgear, but the face must be uncovered. Maybe I will wear my Viking helmet or my Druid’s cowl when I renew my passport. If they say I can’t, then perhaps Cherie Blair will defend my human rights to do so. I doubt it though, human rights don’t apply to Celtic folk.